Just when Jordan Spieth was looking strong entering the final round of The Northern Trust with three strokes lead and ready to win his fourth title of the season, enters the man Dustin Johnson who has been at the troubling side with his putting for some time and takes it away from Spieth. Spieth who has his record of 4-3 in a playoff match had recently won against Daniel Berger at the Travelers Championship, came off short in front of Johnson, who with his huge drive managed to make a birdie on the first playoff hole and winning it. When we try to compare this turn of events, Tiger Woods and Mickelson had met in a playoff only five times out of 300 times they played together, and this feat at Northern Trust with all the hype has paid off. Spieth who had extended his lead from three to five by the sixth hole must not have expected this surprise on the final day. Spieth with his runner up finish now moves to the second spot in the World Ranking with Hideki Matsuyama moving to the third spot. Spieth started facing trouble with a shabby tee shot on the sixth which resulted in a double bogey for him when he had just made birdie on the last hole and another bogey on the par-4, 9th made an extra dent on his score card, with two more consecutive birdies on his back nine on the 13th and 14th got him some relief but by that time, Johnson had started filling gaps. At the 17th hole, Spieth did what Spieth does in these situations when he rolled in an 18-footer for par to keep pace with Johnson; which made DJ’s 17-footer for par on the 18th hole to force overtime that much more impressive. Johnson on the first playoff hole went on to drive 341 yards and was left just 95 yards, good enough for a wedge, while Spieth went for a conservative shot, leaving him 174 yards to the hole. 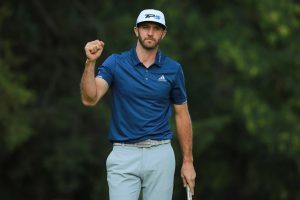 Johnson who had made only four bogeys in his four rounds capitalized his chances in the final round, with 1 bogey in the first round, two in the second, and just one in the third round went bogey free 66 in the final round to win his fourth title of the year. He has won Genesis Open in Feb, WGC Mexico Championship and WGC Dell Technologies in March and added The Northern Trust yesterday. Before entering the playoff Johnson had a record of 0-1 in a playoff match, earlier losing to James Hahn at the same event in 2015, with his win over Jordan Spieth it now stands at 1-1. Its going to be more interesting to see the next playoff games, till then great day. 20% Off Shoes - Nike, adidas, Callaway & More! NEW Callaway Rogue Now Shipping!